In an email interview with CDT, Miller discussed the experiences he had working within China’s censorship regime, and offered his opinions on the tightening of media controls in China since his departure. CDT: As the title of your book hints, its major theme is how censorship authorities leverage fear to do their work for them in the form of self-censorship—and how you acutely felt that even in the editorial room of a monthly English magazine for Shanghai expats. You mention that, coming to China with very little prior cultural and political context, you caught on fast, and that “much of it was acquired through osmosis.” Can you explain what that process was like for you? JFK Miller: The osmosis starts as soon as you begin to occupy the censorship space. It’s like being in a church or courtroom, say, in that you quickly realize that the place itself dictates that you exercise a certain degree of circumspection. In truth, this feeling is palpable as soon as you enter China, but it intensifies dramatically once you begin working in a censorship environment. Your alter ego—the self-censor—makes his appearance at this earliest stage. You also pick up what you can from colleagues with censorship experience, but really these are just the broad brushstrokes. The rest you must figure out for yourself by reading widely, especially websites like CDT which translates leaked diktats from state censorship authorities. You really have no option but to learn censorship this way. It’s not as if the censorship authorities go out of their way to instruct you. Chinese journalists are required to pass a Marxist ideology exam to earn their press credentials. But foreigners working on listings magazines simply aren’t in the same league. There’s no induction course, no manual, no how-to guide—nothing by way of useful instruction whatsoever. On the contrary, the censorship authorities do all they can to prevent you from learning the ropes by blocking the mere mention of censorship behind the Great Firewall. Like the first rule of Fight Club there is a meta prohibition on the thing itself. CDT: I very much appreciated your self-deprecating writing style. A point you continually return to is your complicity in the regime of censorship in which you found yourself Shanghaied—you at one point quote free speech advocate Hu Ping to admit your role as an “accomplice to authoritarianism.” You also remind the reader multiple times of your lowly status as a chief editor at a free English-language entertainment magazine, and contrast your own ignoble position to the risky situations of Chinese investigative beat reporters. Are you being too hard on yourself? Is it in an expat entertainment magazine’s duties or capabilities to speak truth to power in an authoritarian society? JM: I never bought into the conceit that we were publishing anything more than froth and bubble. We produced a good magazine, but it was pure gloss. We were a glorified listings magazine with the occasional pretentious outbreak of sober journalism—nothing more. So, no, I never saw it as my place to speak truth to power. It would have been laughable, really. The other point is that there is simply no comparison between foreign media workers and our Chinese counterparts. Censorship was an imposition we chose to accept. We were not coerced. We could have left our employment, and China, at any time. We held a sort of anti-Green Card—we had the right not to work there. Chinese journalists simply don’t have that freedom. Censorship is something they must endure if they want to remain in their profession in their own country. It’s hardly surprising that Chinese journalism has one of the highest burnout rates in the world. Those who do push the boundaries beyond what is permitted face enormous censure and often jail time for exposing truths that ought to be exposed. It’s easier just to keep your head down, take your hongbao and moonlight with other work. Perhaps even as a censor—one of my own censors was a longtime columnist for China Daily. If I used humor in the book, it’s because I could afford to. Some Chinese writers, like Murong Xuecun, have taken the perilous path of criticism through ridicule and paid the price for it. He has been detained and interrogated by authorities several times for mocking the system. Unlike Murong, I will never have to face the retaliation of those I write about. CDT: Reading your final chapter—especially the part where you poke a bit of fun at the departed laowai’s tendency toward memoir writing—I couldn’t help but wonder: was this book in any way a cathartic exercise, an attempt to absolve residual guilt you may feel for your erstwhile position as a cog in the Chinese censorship regime? JM: I don’t want to overplay the guilt. It didn’t eat away at me incessantly or play constantly on my mind. But every time I read of a dissident being jailed or a journalist being persecuted I knew that I was complicit in the system which permits this. Even if that was as the tiniest cog in the censorship machinery. Writing the book was more dialysis than catharsis. China gets in your blood, but there comes a time when you need a transfusion. It was also a bookend of sorts. My China odyssey began when I went to live in Shanghai in 2005 and ended when I left the country in 2011. I needed to get it out of my system. I also wanted to record censorship as experienced by someone to whom it was entirely alien—a Westerner raised on a diet of free speech who could say, and write, whatever he wanted without question. CDT: You left China just prior to Xi Jinping’s ascension to the highest ranks of Party and state leadership. Under Xi, we’ve seen a hefty reinforcement of state censorship as the president has made sure that the “media bears the Party surname,” handing out harsh sentences to dissenting journalists, and substantially tightening internet controls. You mention towards the end of the book, “Today, China seems even further away from abolishing censorship than it did when I first came.” Have you kept in touch with your former colleagues or your replacement at That’s Shanghai? Have things stayed largely the same, or gotten worse, as far as you can tell? JM: It’s worth recalling that it was only a few short years ago that Beijing was losing the battle over free speech. Its nadir was the 2011 Wenzhou train collision where you had Chinese editors and journalists openly defying censorship authorities by reporting on the crash and demanding answers. At that time, Beijing was struggling to respond with the free-for-all on Weibo. But they’ve since reined it in through repressive measures, including those appalling public “confessions” for recalcitrants which hark back to the Cultural Revolution. The winding back started with the last administration, and has intensified—I think cruelly—under the current one. Most of my former colleagues have now left, but I’ve heard that the screws have tightened at expat magazines, which is no surprise given the broader trend in Chinese media. I can’t see this easing while Xi Jinping is still channeling Deng Xiaoping and Mao Zedong. I’m pinning my hopes on the next administration to swing back a little the other way. CDT: Judging from your book, of the many lessons about China your six years in country made available, an understanding of the nation’s system of censorship seems to be the starkest you walked away with. Imagine if you had taken a different editorial position, either as a foreign correspondent, or an editor for an English-language state media outlet. How do you think your frontline education would have been different? JM: Censorship was my formative experience so, yes, I tend to view China through that prism. If I’d had a different occupation then perhaps I would have a different take. But it would depend on what that experience was. If I’d worked for a foreign NGO then I think my view of China would have been dismal. If I’d been a foreign correspondent and had my visa kept in limbo for months on end I can’t imagine I’d be a happy camper either. Work for the Global Times? I think I would have died of shame. But if I’d worked in, say, banking and finance, especially during the glory days of double-digit growth before the global financial crisis of 2007-2008, then I would probably have come away with a rosier perspective. There are many different Chinas, just as there are many different Americas. But I would say that seeing China the way I did, which was through censorship, was not such a bad way to get to know it. Understanding what can’t be spoken about is one way of understanding the country. It also gave me a firsthand experience of how ordinary Chinese relate to Party members, especially those in positions of censorship authority. A simple telephone call from a Party official is enough to spook an ordinary Chinese citizen. The whole system runs on fear—the people fear the government, and the government fears the people. CDT: One thing that stood out to me—likely due to the work we do here at CDT, but possibly also to changes in authorities’ priorities over the past few years—was learning that your censors didn’t have any “control” over the That’s Shanghai website. By that, do you mean they had no pre-publication control? Would they ever request digital articles be deleted after posted, or did they generally seem unaware of That’s Shanghai’s online publications? JM: They simply didn’t know the website existed. State censors may be pervasive, but they’re not the all-seeing Eye of Sauron. Had my own censors known they would certainly have asked my proprietor to moderate our website. All of the material our print censors disallowed went up, uncensored, on the Web. It was our resurrection ground for articles they’d nixed. It was only when we posted an interview with Richard McGregor about his book “The Party” that we attracted attention from the cyberpolice. My proprietor received a phone call from the local bureau telling us to take it down. But our own print censors knew nothing about it. There was no attempt at duplicity on our part here. Our web content simply wasn’t in their purview so there was no need for us to run it past them. And what they didn’t know didn’t hurt them—they had plausible deniability. CDT: In one chapter, you describe your first experience meeting your censors face-to-face, and you also hint that some of them gained a degree of understanding, if not outright respect from you. However, you also offer the caveat: “I’m sure I’m meant to insert some charitable comments here about my censors, to say I had nothing but the most profound respect for them […]. But I would not only be a hypocrite, but a rare individual.” Reading this recalled Peter Hessler’s essay “Travels With my Censor,” in which the celebrated author and former China correspondent does seem to present some genuine charitable and understanding opinions on his censor/publisher after getting to know him and learning of his attempts to preserve as much original intent as politically expedient. Are you familiar with the essay? Any thoughts on it? JM: Yes. Censors and censorship experiences vary. It’s tempting to think of Chinese censors as automatons in lockstep with one another and Party orthodoxy, but it just isn’t so. Peter Hessler’s censor comes across as far more progressive than my own, which is perhaps why he was more charitable in his comments. I also think there’s an appreciable difference between being subjected to censorship on a single occasion and being subjected to it for a prolonged period like I was. Extended exposure to censorship tends to drain your spirits and whatever charity one might have had towards one’s overseers. I respected my own censors, but in an odd way. After all, they were merely doing a job. I never loathed them, but neither did I develop Stockholm Syndrome. Hence, my lack of charity. I would say that, on the whole, any editor who wants to do their job well is going to have an uneasy relationship with their censor. It has to be this way because our functions are frequently in opposition to one another. Writing is an act of creation. Censorship is an act of destruction. But it was never personal. I met my censors on a single occasion for a period of about two to three hours, including a lunch, and they were pleasant enough. The takeaway for me was the message they wished to impress upon us foreign editors. It was this: “China has come a long way since Reform and Opening Up. Chinese media has never been freer. You can now mention things that would have seemed unimaginable even a few years ago. You can criticize, but not too much. Don’t push things too far or too fast.” Mao had famously written that, “A revolution is not a dinner party.” But what our censors told us was the exact opposite. Their kind of revolution was leisurely, temperate and restrained. No insurrections, no violent upheavals, no crash-through-or-crash politics. But measured, incremental, moderate revolution: a dinner-party revolution. CDT: In that essay, Peter Hessler also talked about the growing tendency for criticism of American authors willing to accept state-sanctioned changes for Chinese publication, a topic he touched on more detail later, and debated with Evan Osnos, his successor for the New Yorker in Beijing. If you were invited into the Osnos/Hessler conversation, how would you weigh in? JM: It depends how desperate you are to reach your audience. I can hardly blame those Western authors who compromise their material so that at least some of it gets into the Chinese public domain. In a post-truth world, one must take what one can get. And some truth is preferable to no truth at all. The high-minded approach of refusing to submit to censorship is also open to you. It’s a principled stand—bravo—but it will cost you precisely nothing except perhaps more book sales. Foreign authors are able to make such decisions because we have no skin in the game. Any choice we make is done so in the comfort and security of being outside the arena. Now, compare that to a Chinese writer or filmmaker. An artist who comes to mind is the film director Li Yang who we interviewed for the magazine. His first film, 2003’s “Blind Shaft,” shone the spotlight on the underworld of China’s unregulated mines. It was denied a theatrical license by censors. His follow-up, 2007’s “Blind Mountain,” was about bride abduction. Li was given a theatrical release for that film, but only after he agreed to more than 20 cuts and an alternative ending which saw the abducted bride rescued by the police. Was he wrong to agree to this, or should he have taken the principled approach to not submit to censorship at all because it might give a false reflection of his source material? Personally, I don’t think Li was wrong. That such an in-your-face film got into the public domain at all is a victory, even if the director’s vision was somewhat compromised. If I had to make the choice myself, my greatest fear wouldn’t be censorship per se, but that they’d make such a hash of it. I just wouldn’t trust state censors to have the finesse that a judicious censorship excision would require. My own censors often took a spoiled-batch approach on account of what they saw as one bad apple. They would ask us to take out an entire paragraph or an entire article even, but when we queried them we’d find it was simply a word or a phrase they objected to. And they didn’t care at all if their ham-handed censorial interventions left the piece totally unworkable. They were butchers, not surgeons. CDT: Finally, I can’t help but inquire: You mention that Li, your former employer, left you with parting words expressing fear that you might get him in trouble: “I hope you’re not planning to write a book.” Have you talked to Li since your book came out? If so, how did that go? JM: I heard he was not best pleased. But I felt I was fair to him and that I’d honestly portrayed him in the book. Apart from his personal eccentricities, he really was no different to any other Chinese publisher trying to make a profit in a business with low margins, and I can hardly hold that against him. He saw censorship as merely something to be managed like any other business risk, and was entirely pragmatic and unemotional about it. It was only we writers who got incensed by it. I can’t blame him for his paranoia either. Susan Shirk calls paranoia “the occupational disease of authoritarian regimes.” And I know from my own personal experience how contagious this disease is. You begin to think as your censors think, which is to see danger everywhere. China’s leaders are paranoid, my censors were paranoid, my proprietor was paranoid, and after a while I, too, became paranoid. It’s no way to live. 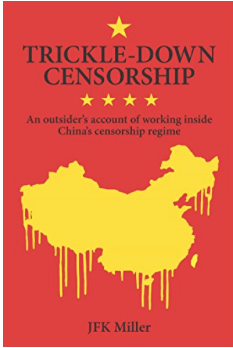 Read JFK Miller’s “Trickle-down Censorship” in its entirety for more insight into the Chinese censorship regime as experienced at the That’s Shanghai editorial desk. Miller is also the founder and curator of Whyiwrite.net, a collection of interviews—many by Chinese and China-focused authors—inspired by George Orwell’s 1946 essay by that name. See also an interview with Miller on the Los Angeles Reiew of Books blog, and a review of “Trickle-down Censorship” from the Asia Sentinel.